I designed a poster for this event. It's being shown at the Am I Collective Garage off of Kloof St (behind Tong Lok) on Sunday 1st August from 1 till 4. The 10and5 Poster Project 2010 is the first of our annual initiative of South African designers and artists designing posters guided by one collective theme. 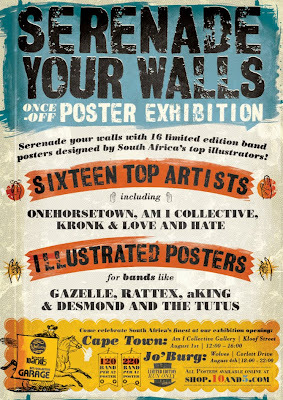 This year’s exhibition is called Serenade your Walls, and is a collection of posters designed for 14 local bands. 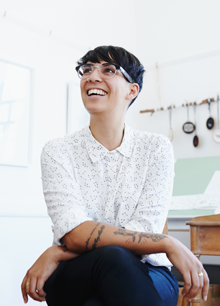 The project aims to showcase South Africa’s finest local design talent, whilst simultaneously celebrating this country’s lively music scene. Serenade your Walls features one guest artist from Argentina and 12 local creatives, who will be showing their A1 band posters at the AM I Collective studios in Cape Town on 1st August and Wolves in Johannesburg on 4th August, respectively.